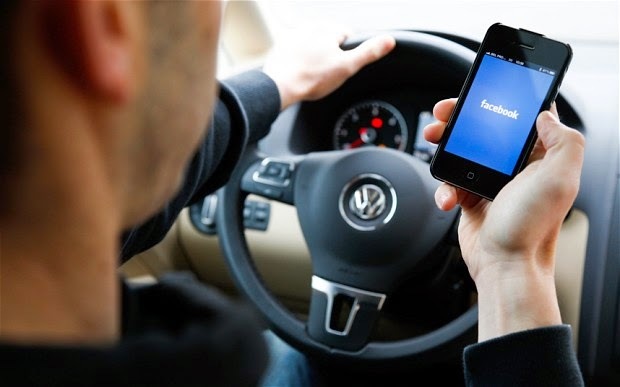 Have you ever scrolled through Facebook while driving? If the answer is yes, please never do it again, but if the answer is a more acceptable ‘No! Who would do such a thing! ?’ then you might be shocked to hear that apparently a lot of people do. A survey taken by AT&T in the USA revealed that 7 in 10 daily drivers use their smartphones behind the wheel. Along with the 4-in-10 using social media (mostly Facebook and Twitter), 3-in-10 surf the net and, amazingly, 1-in-10 use video chat. The sample was taken from 2,000 drivers as a part of the network company’s It Can Wait campaign, encouraging people to keep their eyes on the road and off their phones. Texting remains by far and away the most common phone use for drivers, with email in second and Facebook a close third. Selfie-taking, Snapchat and Instagram all have shame of place further down on the list as well. Of those using Twitter, 30% claim to be using it 'all the time', while 22% of social media users claim that they are addicted. This is a very real, very dangerous problem. In the US in 2012 3,300 people were killed as a result of distracted driving with a further 421,000 injured and in the UK of the 88 fatalities linked to that cause in the same year, 17 were directly blamed on mobile phone use. Even without all the statistics, all you need to do is look around on a car journey and you’ll likely spot someone with one hand on the wheel and the other wrapped around their phone. I see it all the time, and in fact in 2008 I was involved in a rear-end collision as a result of someone texting whilst driving. Thankfully in that case nobody was hurt, but imagine if it had been worse? You might never have had the pleasure of reading this, or any of my other articles. What a horrid world that would be. Misplaced arrogance aside, this grim side effect of smartphone development is one that needs to be addressed. We are increasingly existing within a society which leads people to believe that just because they are able to stay within constant reach of all their contacts and social media accounts, they should never go more than 10 minutes without checking them. Nothing anywhere on Facebook or any of the other platforms is so important that you have no choice but to check it while you’re driving. If your phone bleeps, bongs or buzzes, just find somewhere safe to pull over, take the time you need to address it, then put it down and carry on. Do not endanger yourself and everyone around you for the sake of making sure you weren’t tagged in any embarrassing photos on the staff night out. Somebody could end up dead.